Yoga is often viewed as an activity for the young and flexible. Yet the benefits make it an outstanding form of exercise for older adults as well. Combined with a healthy diet, yoga can help you stay physically and mentally sound for years to come. If you are looking for a new exercise routine to maintain a strong and active lifestyle, try yoga and discover these seven amazing benefits for mind and body. Yoga focuses on unifying the mind, body, and spirit with a blend of stretches and meditation techniques. While yoga’s origins have more spiritual roots, studies indicate that its slow stretching helps reduce arthritic pain. These studies are still in the early stages but revealed promising results for relieving joint pain and improving physical function. Older adults suffering from osteoarthritis or rheumatoid arthritis are very limited in exercises, as basic activities like walking or swimming can inflame the joints. Yoga involves slow stretches and deep breaths that put less strain on the joints. The slow movements increase blood flow and gradually warm up muscles to the yogic postures. Seniors may find that yoga treats their painful arthritis symptoms and improves physical capabilities. Falls are the leading cause of injury in seniors. These falls can result in fractured bones that become more problematic the older you get. Yoga has been shown to prevent these falls by improving balance and coordination in older adults. The exercises and poses involved in yoga increase leg strength and build a stronger core, resulting in a lower risk for falls. Additionally, yoga has proven to lessen the fear of falling in older adults. When seniors worry about dangerous falls, they avoid activities that could result in a fall. This fear creates a cycle of idle behavior leading to stiffness, which decreases movement even further. 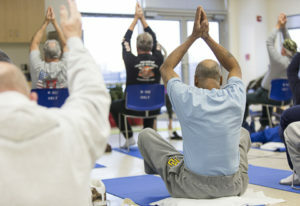 Yoga breaks the cycle and instills confidence in the movements of seniors. Yoga increases lung capacity in seniors with deep-breathing techniques. Aging deteriorates lung tissue and the bones of the rib cage. As lungs and the rib cage weaken, the risk of developing respiratory problems increases. The breathing techniques practiced in yoga keep lung tissue strong and prevent muscles from weakening. Yogic breathing also prevents shortness of breath that can lead to a decline in mobility. Yoga quiets the mental noise and disturbance found in daily life, while boosting feel-good chemicals, scientifically referred to as GABAs. These mental health benefits are especially useful after retirement, when the daily routine changes in the absence of a full work week or child-rearing responsibilities. A study of seniors over 60 that practiced yoga saw a decrease in symptoms of depression and anxiety, with relief lasting for more than six months after yoga sessions finished. Researchers compared walking with yoga to see if the positive effects were the result of simple exercise. However, the findings concluded that yoga was more beneficial than spending the same period walking. Felt tired recently? Yoga may help increase your daily energy levels. Keeping your energy high can be more challenging without the daily reinforcement of a busy work environment or hectic home schedule. Poses that stretch the spine and utilize full-body breathing bring about a sense of invigoration. This increases energy and supplies ample motivation to stay active. Many poses used in yoga require balance, which cannot be achieved without concentration. Maintaining this balance requires focused thought, and this focus results in a heightened sense of being. Try a few of these yoga poses and discover how this ancient exercise technique can increase your energy levels. Yoga’s breathing activates a calm response in the body. The post-retirement increase in free time sometimes gets spent worrying about family, health, financial issues, or other everyday concerns. This can activate the sympathetic nervous system, commonly known as the “fight-or-flight” response, and allow added anxiety to creep into daily life. Practicing yoga teaches you to turn your attention to the parasympathetic nervous system, functions like your breathing and heartbeat. By focusing on the “now,” you enable your body and mind to relax. A study done by researchers at the Harvard University Department of Health Policy found that yoga may reduce the risk of heart disease as much as conventional exercise. By blending physical activity with deep breathing that helps reduce blood pressure, yoga produces many benefits for practitioners. These include an average loss of five pounds, blood pressure reduced by five points, and a cholesterol score lowered by 12 points. The relaxing effects of yoga also bring down stress levels and chronic anger, which have been shown to cause long-term damage to the heart. Yoga helps keep hearts healthy, at any age. Over time, strenuous exercise can become more difficult on the human body. Yoga for seniors allows older adults to stay physically and mentally fit without overstressing joints and muscles. Whether for preventative health or to treat current conditions like arthritis, depression, or high stress levels, yoga provides many benefits for mind and body. Join a yoga class to start enjoying improvements in your mental and physical health.